Wexcoat colloidal silica binder for ceramic shell. This binder which can be reinforced with nylon fibre which gives good early shell strength and helps to keep the coating on sharp corners and details. They burn out leaving a more porous shell which helps disperse gassing and improves filling. Its often possible to have a lower loading of flour in the primary slurry and still obtain the desired viscosity. Please note: This is a new formulation which can be used with the new wex suspension flour which removes the need for continuous stiring of the slurry tank. 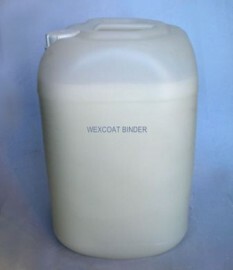 It can also be used as a conventional binder with Molochite -200 flour.